It’s safe to say that absolutely everyone would love to have sparkling white teeth. In a world built on first impressions, nothing makes a better one than a dazzling smile. Of course, keeping your teeth bright white is easier said than done, which is why many people worry about their slightly discolored or stained teeth every day. If this sounds like you, then Aegis Dental is ready to help. We offer professional treatments that can provide the dramatic results you simply can’t get with store bought products, and in the end, they’ll make sure you love the smile you see every morning. Why do I even need teeth whitening in the first place? There are plenty of factors that can negatively affect the color of the teeth. Chief among them are food and beverages with dark pigments that literally stick to the teeth and stain them. These include items like coffee, wine, tea, darkly colored berries, and various sauces. Basically, if it will stain your shirt, it will stain your teeth! Natural aging, genetics, and even some medications can discolor the teeth as well. Enamel naturally wears down over time, revealing more of the yellow dentin that lies underneath. If your teeth are slightly yellowish or brown, then teeth whitening is a great option for you. However, if they have more of a gray color, then they will likely not respond to bleaching, but we can help brighten them using treatments like porcelain veneers and direct bonding. 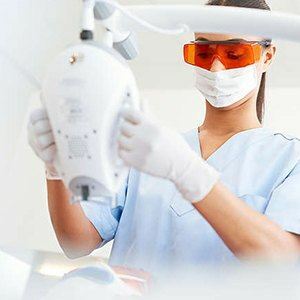 In-Office Zoom!® Whitening: For this, we’ll apply a powerful bleaching gel to your teeth and activate it using a special UV-light to help it break up even the most stubborn stains in record time. We’ll simply apply, remove, and re-apply the gel until we reach your desired level of whiteness. Typically, the entire procedure takes less than an hour and will make your smile up to EIGHT shades whiter. Take-Home Whitening : We can also provide you with your own take-home kit, which will consist of mouth trays designed to fit over your teeth and a potent bleaching gel, one that is much stronger than anything you’ll find in stores. Simply use the kit as directed for two weeks to achieve complete results! They can also be used to give your teeth a touch-up after an in-office treatment. If you’ve been wanting a whiter smile for a while now, Aegis Dental can help you get it, and it will likely be easier and take less time than you thought. To learn more about teeth whitening or schedule an appointment, contact us today.